Dennis the Menace and Gnasher (previously titled Dennis and Gnasher, and originally titled Dennis the Menace) is a long-running comic strip in the British children’s comic The Beano, published by D. C. Thomson & Co., of Dundee, Scotland. The comic stars a boy named Dennis the Menace and his Abyssinian wire-haired tripe hound Gnasher. The strip first appeared in issue 452, dated 17 March 1951, and is the longest-running strip in the comic. From issue 1678 onwards (dated 14 September 1974) Dennis the Menace replaced Biffo the Bear on the front cover, and has been there ever since. Coincidentally, on 12 March 1951, another comic strip named Dennis the Menace debuted in the United States. The two strips should not be confused – as a result of this the US series has been retitled Dennis for UK consumption, while the British character’s appearances are often titled “Dennis and Gnasher” outside the UK. Dennis the Menace and Gnasher was first drawn by David Law (1951 – 1970), then David Sutherland (1970 – 1998). David Parkins took over in 1998, but due to his other work commitments, Nigel Parkinson and Jimmy Hansen have drawn the lion’s share of the strips for some years, and Parkins has not drawn Dennis since 2006. More recently, Tom Paterson has drawn some second Dennis strips for the comic’s rear pages. Barrie Appleby did the artwork for the Beano Superstars series, which, towards the end of its run, resorted mostly to strips based on the TV series. In 2011, he took over as Dennis’s main artist. Upon the November revamp of The Beano, Nigel Parkinson took over as Dennis artist as Barrie Appleby had moved back to drawing new episodes of Roger the Dodger. During this revamp, Dennis was returned to his previous appearance and personality – Nigel Auchterlounie began writing for Dennis a month after and made Dennis (and the other characters) have wider personalities. Nigel Auchterlounie has proven to be a very popular writer since taking over Dennis. Dennis the Menace (UK comics) is the original title of a British comic strip which first appeared in “The Beano” on March 12, 1951 (in the edition cover dated March 17, 1951); it is now published as Dennis the Menace and Gnasher. Dennis the Menace Annual, now known as the Dennis and Gnasher Annual, is a compilation of the comics plus new material. Dennis the Menace (1996 TV series) is an animated television series based on the Beano comic strip, known internationally as Dennis and Gnasher. Dennis the Menace and Gnasher (2009 TV series) is the latest series based on the Beano comic, released on September 7, 2009. 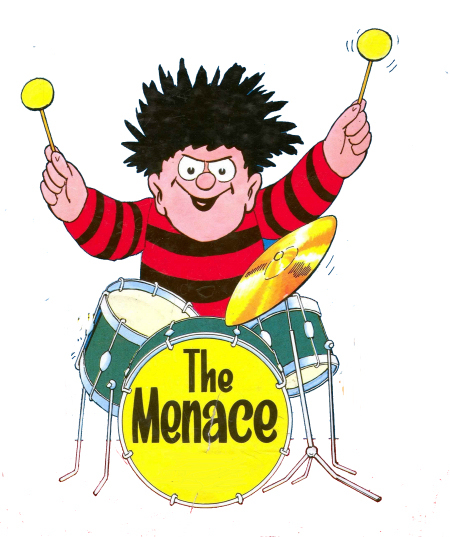 The idea and name of the character emerged when The Beano editor George Moonie heard a British music hall song with the chorus “I’m Dennis the Menace from Venice”. The character of Dennis was initially a struggle for artist Davey Law and then Beano chief sub Ian Chisholm to develop. Chisholm described the character to Law but was dissatisfied with every sketch the artist showed him. Out of frustration, Chisholm grabbed a pencil and quickly sketched out his creation to Law in the back of his cigarette packet. The drawing consisted of Dennis’s trademark messy hair cut, knobbly knees and menacing scowl. Adapting Chisholm’s doodle, Law set to work on the character in the strip which would appear in the 17 March 1951 issue of The Beano. Two months later, Law gave the mischievous boy his distinctive red and black striped jersey, outsized shoes and devilish grin. Dennis’s first comic strip appearance consisted of him walking into the park with his father and his dog where a sign is planted informing visitors that they should ‘Keep Off The Grass’. Keeping in with his ‘World’s Wildest Boy’ tagline, Dennis makes many attempts to get onto the grass much to his father’s annoyance. Losing his temper, he takes the lead off the dog and puts it on Dennis thus ending the menace’s hijinks. This, like many succeeding it, only made up half a page. It wasn’t until around 1954 that Dennis was deemed popular enough to gain a full page strip. Untouched by political correctness, many of Law’s strips would end with Dennis being punished for his troublemaking with corporal punishment such as a slippering or use of a cane. Throughout the years, Law’s Dennis became taller than his debut appearance. It is not known why Law chose to do this, but many believe it was due to Law’s perfectionist nature. In 1954, Dennis replaced Big Eggo as the character next to The Beano title citing one of many changes of the comic during this period. The following year, Dennis became one of a few characters from DC Thomson comics to be featured in his own annual (the 1956 edition) which continued to up to 2011. Dennis was also present in the first Dandy-Beano Summer Special, where he appeared in full colour. This strip featured Dennis begrudgingly selling flags in aid of the Dog’s home. Bored, he chooses to make this a perfect aid to his menacing. Dennis continued to gain popularity solo as time moved on. It wasn’t until 1968 that his trademark pet, Gnasher, was introduced, marking comic history. On 31 August, a strip depicted Dennis being informed by his father that many pets look like their owners. Dennis dismisses this as being a load of ‘rot!’ and goes out. However, upon seeing many different owners looking just like their dogs he begins to consider that it may be true. Upon being informed of a dog-show, Dennis decides to enter but needs a dog to do so. This was when he found the Abyssinian wire-haired tripehound roaming the streets of Beanotown. Menacing the dog show rather than attempting to win it, the duo are eventually caught and punished. Gnasher returned the following week and became a comic favourite as well as the fictional Menace’s best friend. In 1970, Davey Law took ill and retired from the strip, leaving Dennis in need of a new artist. Dave Sutherland, who was already the artist of Biffo the Bear and The Bash Street Kids, was chosen. Dennis made a cameo in a Biffo the Bear story in 1972 citing his wish to be on the cover. This dialogue proved to be almost prophetic as he became the cover star of the comic in 1974, a position he still holds today. His first cover story consisted of him using the issue’s free gift, the Happy Howler to torment people including his Dad and in an Opera House, who gives Dennis’s Dad a free gift of his own, a slipper. Dennis’s popularity was emphasised in 1976 when he was awarded his own fan club. Members would get a membership card, a club wallet and two badges. This later became the foundation of The Beano Club years later. The club was well known for being popular amongst celebrities as well as Beano readers. Phil Lynott, Mark Hamill and Linford Christie were among many to join. A strip promoting an all new Dennis T-shirt for club members emerged in 1978. It featured a guest appearance from Minnie the Minx and consisted of the two fighting over who the red and black jersey image truly belongs to. 1978 also saw The Beano at 40. To celebrate Dennis’s weekly comic strip this week featured him celebrating his birthday and his menacing antics with his brand new cowboy outfit. In 1980, The Beano reached a landmark 2000th issue. The front cover depicted Dennis offering to show readers the very first issue of the comic. Incidentally and fitting well with the character’s menacing nature, the comic was at the bottom of the pile. The character was then featured in one of the very first Beano spin-off comics, The Beano Comic Libraries. He was one of the first Beano characters to get a feature length story which in turn was called ‘King Dennis’. Dennis was also a character present in the most successful Beano annual to date in 1983. In 1986, one of Dennis’s very first story arcs appeared. Gnasher, his faithful companion, had gone missing. Distraught, Dennis asked readers to join him on a ‘Gnational Gnasher Search’. At first, Dennis’s dad was far happier without the tripe hound but as the week wore on he found himself missing him. The story wore on for seven weeks before Gnasher returned, a father with his six daughters and son, Gnipper, who would later become a key character. On The Beano’s 50th Anniversary, Dennis’s strip consisted of him saving The Beano’s birthday cake which had begun to float away after the rope in which the sailor was pulling it along with was cut by a nearby crab. A landmark issue for Dennis appeared in 1991, as the Beano announced they were to change his image. The news received much media attention throughout the UK and it was later revealed to be a publicity stunt in the very strip the image was introduced. Dennis’s new attire consisted of a blue tracksuit, sunglasses and headphones connected to a walkman. However, the tracksuit bottoms ripped due to Dennis’s knobbly knees and he ditched the jacket as his father could catch him easier after he had menaced. The end of the strip showed Dennis returning in his trademark jersey and shorts and pea-shooting his nemesis Walter. Dennis also played a vital role in the storyline in which The Beano was turned into colour. The front cover of the famous 2674th issue of the comic depicted Dennis spraying other famous Beano characters with a hose of paint. In 1993, Beano editor Euan Kerr was becoming concerned at the direction David Sutherland’s depiction of the character was taking, with Dennis becoming ever stockier and larger. Kerr, feeling that Dennis was beginning to resemble a thuggish teenager rather than the naughty boy he was intended to be, told Sutherland to make Dennis look younger in appearance. As a result, Dennis was made shorter, with a smaller chin. He retained his familiar outfit, but started to wear trainers. These changes were also made with the intention of making the character easier to animate for the forthcoming Beano Video. In 1996, the first Dennis animated series was released on the UK station Fox Kids, with a second series following in 1998. After the Beano’s 60th anniversary issue in 1998, David Sutherland stopped drawing the strip, and was replaced by former Billy Whizz and The Three Bears artist, David Parkins. Parkins’ first Dennis strips featured a storyline that formally introduced Dennis’s younger sister Bea into the comic. The story lasted three issues and consisted of Dennis’s fear that a younger sister would ruin his reputation as the toughest menace in Beanotown. However, as it turned out Bea was as much of a menace as her older brother and even gained her own spin-off strip, which Dennis would sometimes cameo in. Dennis kicked off the new millennium with a strip of him charging 50 pence to access the Menace Dome, a more ‘menacing’ version of the Millennium Dome. He also starred as a villain in a feature length Bash Street Kids strip in which he, alongside Minnie the Minx and Roger the Dodger, raced against the Bash Street Kids to find the treasure which was apparently buried underneath the Millennium Dome. It ended with Danny, the Bash Street leader, outwitting Dennis and his cronies and Dennis angrily blaming it on Roger. Whilst a rivalry with The Bash Street Kids was touched on before in other strips, it was this story which made the rivalry far more well known. Several succeeding feature length strips after, usually drawn by Mike Pearse or Kev F. Sutherland, further depicted the rivalry even to the point it would get violent. He also made other appearances in the spin-off Bash Street Kids – Singled Out, where he would take on a similar role. In the same year, Dennis became a major mascot for the Chessington World of Adventures section, Beanoland. He was featured prominently throughout the land including a large figure atop of the shop, a member of the squirting water fountain, a character on the dodgems, a silhouette on the entrance and a cast member in the live show located in his treehouse. Later in the park’s history, Dennis’s Madhouse was introduced which was a foam ball play area. In 2008, the land was changed into Wild Asia. In 2001, Dennis turned 50 and celebrated with a house party in which several Beano characters were invited. Humorously, all his gifts consisted of the 2001 Beano Annual, apart from Les Pretend’s which was simply a pretend annual. He later participated in several party games which he changed radically to be far more menacing but found that most of the games back-fired onto him. The party was then finalised with a large food fight and then the entrance of The Dandy characters and other celebrities who had brought over a cake as the party continued for several more hours. Dennis’s parents then hid and Dennis was forced to tidy up the mess. The same issue also showed readers how Dennis received his trademark jersey which, it reveals, was initially owned by a boy called Tufty. After Tufty asks when someone would land on the moon, to which Dennis accurately predicts 20 July 1969, Dennis offers to give him the chance right then. He attaches his granny’s homemade soda pop to Tufty, shakes him then removes each of the lids which causes Tufty to blast off and fall into a nearby lake. Dennis then grabs the jersey and puts it on remarking it ‘feels right somehow!’. In 2003, Dennis appeared as a playable character in the PC game Beanotown Racing. He was featured in several strips leading up to the games release depicting how he received his vehicle and races he got into prior to the games events. This includes a rivalry with Minnie the Minx who had gotten her vehicle before him. Dennis tuned up his Menace-Mobile to make a dune buggy. David Parkins’ workload meant he was able to draw the strip on an increasingly less frequent basis throughout his time on the strip, and after 2003 he became too busy to continue as full-time artist. Nigel Parkinson, who had previously been drawing the strip as Parkins’ understudy, continued as artist, along with Jimmy Hansen coming in to replace Parkins. The pair drew the vast majority of stories between 2004 and 2007, when Tom Paterson also started drawing the strip. In 2008, Dennis was given an extra strip towards the back of the comic, usually a continuing story across a few weeks. These strips were usually drawn by Tom Paterson. One such story featured the illness of Gnasher’s young pup, Gnipper who had been bitten by a poisonous snake. Throughout this story, Dennis and Gnasher called upon help of various past characters of the strips history before finally contacting Gnipper’s many sisters who successfully managed to get him out of his coma. Walter also changed in the strip as Dennis was given more reason to belittle and menace him. Instead of being camp and frilly, he was quite rude and obnoxious especially towards Dennis and his friends. However, Dennis seemed to be more of a bully than an anti-hero in this age. In 2007, Dennis was featured on the front page of a new magazine BeanoMax and was the coverstar until 2008 where he was replaced by Max, an exclusive character. Another landmark issue was met in 2008 where The Beano turned 70. As a celebration, Dennis was seen on the cover sharing a cake with Wallace and Gromit, whose creator was featured heavily in the issue. When the strip was relaunched in 2009, Dennis faced several changes to his character and appearance. It was the first major revamp of the character since his debut over 50 years prior and proved vastly controversial. Parkinson, Hansen and Paterson continued to draw the strips, although . Dennis became slightly shorter with a boyish look to him as opposed to the brute, tough guy look the previous artists had established. His behind the nose grin was used far less frequently and most of his menacing was toned down. He also no longer used weapons such as a catapult or peashooter save for a few times, so he became more creative in his mischief. The strip’s title was shortened to Dennis and Gnasher during these years, and Dennis rarely used the term ‘menacing’ to describe his actions. Dennis’s idol was revealed to be ‘Rat-Bucket’ a fictional heavy metal singer introduced in the strip. He was also given more rivals as Athena and Sugar were both introduced to the strip. He was also given a new spin-off called Sixty Second Dennis. This was a single page strip which featured Dennis in a short story, and was usually illustrated by Nigel Parkinson. The reason behind the re-launch was to promote the new TV series which was just about to hit screens in Britain. It followed Dennis, Curly, Pie-Face and Gnasher as they attempt to brighten up the average day in Beanotown through new ideas, adventures and pranks. On 27 November 2010, The Beano Club was relaunched into The Beano V.I.P. It was officially announced vis a Dennis strip where several British celebrities including Ant and Dec, Simon Cowell and Daniel Radcliffe visited Beanotown in an effort to join the club but all failed as they were not deemed tough enough. In the end, Dennis decides its only the reader who can become a Beano V.I.P. This was the first strip in which Dennis seemed to actually do his ‘menacing’ intentionally since his re-launch in 2009. In early 2011, Dennis’s re-launched character slowly and subtly began returning to his ‘menacing’ ways. He began using his weapons again and referring to his antics as menacing. He also began to do his menacing more intentionally as he did in all previous eras. Barrie Appleby, who had previously drawn Roger the Dodger, became the artist as the strip was extended to three pages rather than the usual two. Sixty Second Dennis was also dropped, being replaced by a Gnasher spin-off strip called Gnashional Treasure, which was later renamed as Gnasher’s Bit(e). Although the strip continued to be known as Dennis and Gnasher, Dennis was once again overtly referred to as ‘the menace’, and by his 60th Birthday, Dennis had returned to his original character although he still has the likeness of his 2009 TV series counterpart. Meanwhile, Nigel Parkinson continued with lengthier BeanoMAX stories which would often feature other Beano characters. By August 2012, Dennis’s 2009 re-launch was reverted following yet another re-launch of the comic. His illustrations were more in tone with David Parkins’ era and he partook in genuine naughtiness and disruption again. Barrie Appleby returned to Roger the Dodger, whilst Nigel Parkinson began weekly strips. Like his 2009 re-launch, Dennis faced several new changes mainly due to a new editor. His old behind the nose grin returned and he began to once again refer to himself as a ‘menace’. His parents had a make-over, so his traditionally balding father now shared his messy spiked hair and his mother was no longer neatly shaped. Gnasher also returned to normal. A new character called Angel Face was also introduced into the strip, in order to give Dennis more of a rival. In honour of the 2012 London Olympic Games, gold medalist Jessica Ennis appeared in a strip, much to public attention. Paralympic runner Oscar Pistorius also appeared, with the current editor, Stirling citing that ‘When people told Oscar he couldn’t be an athlete due to his disability, he ignored them and, in that respect, he’s just like Dennis, who never does as he is told.' Both strips were extremely well received amongst both the athletes and the public. During Series 12 of Mock the Week, host Dara Ó Briain, and comedians Hugh Dennis, Andy Parsons and Chris Addison were drawn by Nick Parkinson in a one-off pic with Dennis, which was shown in the second episode, whilst they and guest comedians were discussing about the appearance of Charles, Prince of Wales and Camilla Parker Bowles in The Beano. Each celebrity was drawn holding a weapon – Hugh had a peashooter, Chris had a watergun, Dara had a plunger and bow, and Andy had a catapult, and all four were drawn with Dennis’s trademark red and black striped top, shorts, black socks, and brown shoes (except Andy, who had red trainers). Starting in November 2012, Dennis was written by former Dandy writer, Nigel Auchterlounie, who gave Dennis and the other characters wider personalities. Auchterlounie’s strips have been very well received since taking over the strip. Dennis’s younger years in Beanotown Preschool were chronicled in a strip called The BamBeanos. Dennis is an uncontrollable schoolboy who takes pride in causing chaos and mayhem to those around him due to his intolerance for rules and order. Such traits have caused some artists and writers to consider him a villain. In such strips, Dennis would often prove himself to be quite selfish and greedy, often disregarding his friends in favour for treasures. His misbehaviour stems from what The Beano explains as an attempt to add excitement to an otherwise dull day. Often equipped with a red and black jersey and an array of menacing weaponry (such as a catapult), Dennis is considered to be quite the loner, seeking no solace in anyone’s company aside from his faithful pet dog Gnasher. Feature length strips in The Beano reveal that Dennis actually has a rivalling nature with The Bash Street Kids, often brawling and attempting to outwit them. Most notably, he seems to have a particular dislike for Danny, the leader. He has, however, been shown to have a fairly stable friendship with Minnie the Minx and Roger the Dodger, enough so that the three have been seen to work together often. Dennis has also been shown to be quite heroic, having saved his town on occasion from potential disaster. The Beano Annual 2001–2002, both exemplified this in their stories in which Dennis defeated a race of ‘Beanobots’. Even though many strips depict Dennis as being fairly academically challenged, he is in fact extremely inventive and clever when it comes to mechanics. On occasion, it has been shown that Dennis can make from scratch his very own vehicles including a Menace Dune-Buggy, a working rocket and other such things. Over the years, a variety of subsidiary characters have arisen. Dennis is the main character of the strip. Badly behaved and visually rebellious, Dennis uses a wide range of pranks and weaponry in order to cause chaos and mayhem to those around him. He is trademarked by his scruffy, black hair and red & black jersey. Dad appeared in the first strip. His real name has never been given (although once it was cited as actually being “Dennis’s Dad” in a letter by Dennis). He also appears in both Bea and Gnasher and Gnipper. The real name of his wife, Mum, has also never been given (again in the same letter, it was stated that her actual name is “Dennis’s Mum”). In the 2012 revamp, he was redrawn to look more like Dennis. This was explained in 2015 as Dad now being the grown up version of the 1980s Dennis the Menace, making the 1980s Dad a Granddad. Bea is Dennis’s little sister, born in issue 2931, dated 19 September 1998. She has her own strip (Bea, originally Beaginnings) and sometimes appears in Dennis the Menace and Gnasher. Bea wears a stripy yellow and black vest, this is a pun on her name as the colours are the same as the colours on a Bumble bee. Granny, is Dennis’s and Bea’s 80-year-old grandmother. In the late 1980s/early 1990s, she got her own strip Go, Granny, Go! drawn by Brian Walker. This transformed her from the indulgent Granny who used the Demon Whacker when necessary to a very active elderly lady who enjoyed motorbikes, similar to Cuddles and Dimples’s granny, partly because, by this time, characters in The Beano were no longer punished with the slipper. She also appeared regularly in the 2009 TV series, where she is married to a man who is presumed to be Dennis’s granddad. Denise is Dennis’s cousin, who bears a striking resemblance to Beryl the Peril, although she also wears a red and black striped jumper. She appeared in just a few stories, visiting along with her cat Santa Claws. She generally managed to out-menace Dennis, showing considerable fortitude against the Softies, and at the local boxing club. Santa Claws also appeared in a Roger the Dodger strip in the 2008 Beano Annual. Gnasher is a black dog (an “Abyssinian wire-haired tripehound”) who first appeared in issue 1363, dated 31 August 1968. He has extremely strong teeth that can leave teethmarks in seemingly anything, and enjoys chasing postmen. His name comes from the British slang for teeth (gnashers), which in turn comes from the French ganache meaning “jowl”, a word also used in chocolate manufacture. In the first ever Dennis the Menace strip, the family also had a pet chihuahua, who has not since appeared. Since 1986, Gnasher has had a son, Gnipper, who appears with him in the separate strip (Gnasher and Gnipper). Gnipper is owned by Dennis the Menace. He first appeared in issue 2286, dated 10 May 1986 after a story arc in which Gnasher went missing, this story arc was reprinted in the Dennis the Menace Annual 1990 as a 16-page story entitled Who’s Gnicked Gnasher. Gnipper’s name is a pun since ‘to nip’ something means to give something a small bite, while ‘nipper’ is a slang term for a young child. Gnasher also has several daughters: Gnatasha, Gnaomi, Gnanette, Gnorah and Gnancy, although these are rarely seen. Gnatasha had her own strip in The Beezer and Topper, and appeared in the Beezer Book 1994. Gnasher also used to have another strip, Gnasher’s Tale, which began in 1977 and continued for nine years until the title was changed to Gnasher and Gnipper following Gnipper’s introduction. Rasher is a pig, first seen in issue 1920, dated 5 May 1979. He loves to eat swill and was rescued by Dennis. Rasher also has children: Oink, Snort, Grunt, Squeal, and Squeak. He used to have his own strip called Rasher, which started in 1984 and appeared regularly for four years before making sporadic appearances until 1995, Rasher’s strip also appeared for a few weeks in 2010. He was believed to have been dropped after the strip was revamped in 2009, but he made a surprise return to the strip in 2011. In the 2009 TV series, Rasher and Gnipper are owned by Dennis’s Granny. Dennis has been seen with his pet spider called Dasher. He first appeared in about 1987, as a tool to scare Walter, and was the mascot of the Beano website when it launched in 1997. Originally, the spider was all black, but when it reappeared in 1997, it was red and black, matching Dennis’s jersey. He appeared a few times from 1997–2008, and than reappeared in the 2011 and 2016 Halloween issue. Dennis has two main friends: Curly (real name Crispin), who has a lot of strawberry-blonde, curly hair, was the first to appear, debuting months after the strip started in 1951 . Although Curly and Dennis get into many fights, they still remain the best of friends, and Pieface (real name Kevin), whose favourite food is pies. Dennis, Gnasher, Curly and Pieface are collectively called “The Menaces”. They all are in a band called Dennis and the Dinmakers. Pieface currently has his own strip in The Beano as well as his ‘pet’ Paul the Potato. They are both by Nigel Auchterlounie and Diego Jourdan. Since the 2017 revamp, however, Curly seems to have largely disappeared. In his place are two girls, Rubi (from The Beano’s ‘Rubi’s Screwtop Science’ strip) and JJ (from the comic’s ‘JJ’s Jokes’ strip). Despite Dennis’s previous resentment towards most girls in earlier years, he accepts them as his friends. The rival gang to the Menaces is the Softies, a group of children who enjoy things such as teddy bears, dolls and flowers. The most famous, Dennis’s greatest sworn enemy, is a character called Walter, sometimes called the “Prince of Softies”. He has a pet poodle called Foo-Foo. The two most other frequently seen Softies are Algernon ‘Spotty’ Perkins and Bertie Blenkinsop. Other softies, seen less often, have included Bennie Benry, Sweet William, Dudley Nightshirt, Jeremy Snodgrass, Softy Matthew, Softy Pal Erasmus, Lisping Lester, Matilda (Walter’s girlfriend introduced in the 1996 TV series), and Nervous Rex, a character who is scared of everything and everyone. For a brief time in the late 1970s/ early 1980s, Curly also appeared in the softies. The Colonel is an old army colonel, who is often seen with toy soldiers and often makes references to being in battles which happened hundreds of years ago. In an episode of the animated TV series entitled ‘The Trial’, his first name was revealed to be Godfrey. Sergeant Slipper is the police sergeant who is always trying to catch Dennis for menacing. In the 1960s a well-known police officer was known as Slipper of the Yard, though “slipper” is also a nod to the instrument with which Dennis’s father usually chastised him before corporal punishment was deemed politically incorrect. Dennis’s Teacher often appeared in Dennis the Menace strips from the early 1970s and has been replaced, although the character was absent for most of the intervening period, in the 2009 TV Series by another Teacher named Mrs Creecher. Nasty Norman was a bully often seen as Dennis’s rival. Stanley Livingstone an explorer with a pet crocodile, who lived next door to Dennis. Seemingly replaced by the Colonel, though the character had disappeared a while before the Colonel first appeared. His name alludes to the explorers David Livingstone and H.M. Stanley. March 1951: Drawn by David Law, Dennis the Menace appeared for the first time, as well as his dad. May 1951: Dennis got his (in)famous red-and-black striped jersey, knitted for him by his granny (aka Whentball). He also teamed up with fellow menaces Curly and Pie-Face. The strip appeared in two colours (red and black). 1952: Walter appeared for the first time (unnamed). Early 1953: Walter was named. Mid-1953: Dennis got expanded to a full page, while earlier strips were only half a page long. 1954: David Law’s style of drawing Dennis changed dramatically, making the characters tall and thin. Dennis appeared on the back page in full colour for the first time. 1955: The first Dennis Annual was published, using reprinted stories from previous years. 1958: After four years of being drawn this way, characters become more or less back the way they were. Dennis returned inside the comic. 1962: Dennis returned to the back of the comic. 31 August 1968: Dennis found a dog on the street, Gnasher, on his way to the dog show at the local town hall. Gnasher became a regular from this point onwards. 1969: Walter’s dog, Foo-Foo, debuted. 22 July 1970: David Law retired, and one comic was drawn by Pup Parade artist Gordon Bell. 29 July 1970: Bash Street Kids artist Dave Sutherland started drawing Dennis, although drawing the strip almost identical to David Law. The strip was renamed “Dennis the Menace & Gnasher” when originally it was just called “Dennis the Menace” as Gnasher had been appearing every week on the strips. 14 September 1974: Dennis took the front cover of The Beano replacing Biffo the Bear. 1975: Walter joined “the softies”, Bertie Blenkinsop and Algernon “Spotty” Perkins. 21 May 1977: Gnasher got his own strip in the comic, called “Gnasher’s Tale”, also drawn by David Sutherland. May 1979: Dennis’s pet pig, “Rasher” debuted. Early 1980s: Use of the slipper became increasingly rare in this time, having been very common in earlier strips. 22 September 1984: Rasher got his own strip in the comic, called simply “Rasher”. Again, David Sutherland is the strip’s artist. March 1986: Gnasher “went missing”. Foo Foo’s Fairy Story temporarily replaced Gnasher’s Tale. May 1986 Gnasher returned, introducing his pups; Gnatasha, Gnanette, Gnancy, Gnaomi, Gnorah and Gnipper. “Gnasher and Gnipper” replaced “Gnasher’s Tale”. 1987: Dennis’s spider, Dasher, appeared. 1988: Rasher’s strip ended, replaced by Ill Will and the Germs. 1990: Granny’s personality was changed drastically. Now, rather than a mean old woman, she became an elderly menace. The slipper was no longer used, partly due to changing attitudes towards child discipline at the time. 1992: The Menace Car was seen for the first time. February 1993: David Sutherland, Realising how stocky and bulky he became in recent years, started changing Dennis, making him look young and cute for a few years. The “Gnasher and Gnipper” strip was taken over by Barry Glennard in order to ease Sutherland’s workload, though the style remains similar. Early 1996: Dennis The Menace was looking like he did again, and for the first time ever, the story was drawn in the same style as the Bash Street Kids. April 1996: The Dennis the Menace TV series appeared for the first time on BBC and TCC. 1996: This year marked the first appearances of The Colonel, Dennis’s neighbour, and Sergeant Slipper, the local constable, who had both previously appeared in the television series. From this point onwards the front cover page usually consists of just one frame of the strip rather than several. 1998: Dasher re-appeared with a red mask as the mascot of the Beano site. August–September 1998: For the 60th anniversary for the Beano, David Parkins started drawing Dennis the Menace, creating Bea some issues later. October 1998: Bea got her own strip called Beaginnings drawn by Nigel Parkinson. She said her first word (Mud) in this strip. 1999: Nigel Parkinson became Dennis artist for the first time. February 2001 The Gnasher and Gnipper strip was revamped, now being drawn in Barry Glennard’s own style. March 2001 Dennis celebrated his 50th Birthday. A special episode drawn by David Parkins (In the style of David Law) was released in the issue, telling the readers how he got his striped jersey. December 2001 Beaginnings got renamed Dennis’s Little Sister Bea – the Mini-Menace. 2002: Buster artist Jimmy Hansen drew his first Dennis strip. By this time, Nigel Parkinson was drawing Dennis as often as David Parkins, and effectively became main artist the following year. 2004: David Parkins stopped drawing Dennis altogether, and Jimmy Hansen joined Nigel Parkinson as main artist. Over the next 5 years they each drew about half of the strips. Walter got revamped when drawn by Jimmy Hansen, and he now bears the appearance of an Elvis impersonator with much bigger glasses. 2004: Dennis the Menace became the longest running strip in the Beano ever, beating Lord Snooty. 2007: Tom Paterson started drawing Dennis occasionally. 2008: Dennis got a comic strip at the back of the Beano as well as the front. The second strip was usually drawn by Tom Paterson. It is now clear that Walter has a new personality. Instead of being a gentle, well-behaved boy, he’s become camp, considerably meaner, and almost certainly evil. 2009: A brand new series was released, again on the BBC. For the new series, Dennis and Gnasher were revamped, not just for TV but also in the comic. The second Dennis strip was replaced by Sixty Second Dennis, which takes up just one page as opposed to two. The main Dennis strip is now mainly drawn by Hansen, with Sixty Second Dennis usually by Nigel Parkinson. 2011: Barrie Appleby took over as full-time Dennis artist. The strip isn’t as influenced by the 2009 series now, with Dennis behaving more menacingly, the series-style backgrounds being dropped, Dennis being referred to more often as ‘the menace’ and the return of several characters who disappeared around the time of the new series, such as Foo-Foo. Also around the same time, Sixty Second Dennis gets replaced by a new Gnasher strip, titled Gnasher’s Bit(e), drawn by Jimmy Hansen. March 2011: Dennis celebrated his 60th birthday. August 2012: Changes made by previous relaunch were reverted. Nigel Parkinson begins regular weekly strips. July 2013: A second season to the 2009 series renamed Dennis the Menace and Gnasher and the Dennis the Menace and Gnasher Megazine have both been released to coincide with the 75th anniversary of The Beano. March 2014: The Dennis the Menace and Gnasher Megazine was renamed Dennis the Menace and Gnasher’s EPIC Magazine. 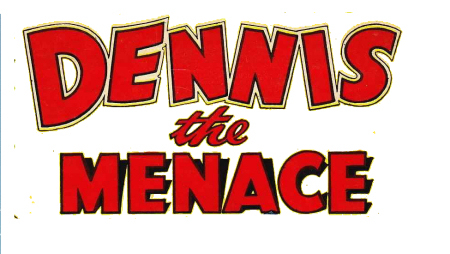 Dennis’s first regular TV appearance was in the puppet series The Beano’s Dennis the Menace and Gnasher Show that originally aired on Children’s Arm of ITV and then shown on TCC, starting in 1990. The show was directed by Bob Harvey, written by Mike Barfield, and all the characters were voiced by Logan Murray, with artwork by John Bonner. The first series featured only the puppets Dennis, Gnasher and Walter. The second series in 1991 added Mum and Dad. The punk-style theme music was by John du Prez. Dennis appears alongside other Beano characters in the made-for-television/direct-to-video release, The Beano Video. Dennis was voiced by Susan Sheridan. All the stories were adapted from previous Beano strips, it was aired on ITV. Dennis appears once again in The Beano Videostars DVD, this time attending a premiere to an all new Beano feature. In this film, several Beano characters attend a premier in which a brand new Beano film is being shown. Dennis arrives in his ‘Menace-Mobile’ and pelts the narrator with tomatoes in his usual menacing fashion. Susan Sheridan once again served as Dennis’s voice, Aired on ITV. Dennis was the main character of a 1996 TV Series originally titled Dennis the Menace but changed in the second season to Dennis & Gnasher. This version of Dennis still gets up to the same old tricks. Throughout the whole series, however, he does not once use a catapult or a peashooter and is often far more heroic than that of The Beano version. The show ran for two seasons and was shown on TCC, CBBC and Fox Kids. Richard Pearce voiced Dennis in this series. Later in 2009, Dennis re-appeared on television again in a series once again called Dennis & Gnasher. His behaviour was toned down far more showing quite a different personality to that of the comic Dennis, which was changed to match the TV series but has since gradually changed back. This Dennis preferred fun over mischief and often did menacing inadvertently. The first season ran for 52 episodes on CBBC. However, in mid-2013, the show has currently returned but with a new name called Dennis the Menace and Gnasher. Dennis’s behaviour has improved by making him behave and sound more menacingly and as of recent, the second season is also running for 52 episodes on the CBBC channel. Dennis was voiced by Sophie Aldred in the first series, and Chris Johnson in the second series. Dennis is playable in the PC Game Beanotown Racing. His vehicle is his Menace-Mobile, designed as a dune buggy. Dennis and Gnasher appear as non-playable characters in the IPhone game, Dennis & Gnasher: Blast in Beanotown. Dennis was the main mascot for the Beanoland section in Chessington World of Adventures, from 1999 to 2010. He was a Meet & Greet character as well as the subject of a short lived amusement show located in his tree house. A fun house in which children could fire foam balls at each other was built later on in the park’s history and named ‘Dennis’ Madhouse’. In 2015 it was announced that a musical based on the comics will be presented for the Old Vic Theatre in London as part of artistic director Matthew Warchus’ musical commissioning programme with producers Scott Rudin and Sonia Friedman. Playwright and poet Caroline Bird is writing the book. More details to be announced.